Still using paper registration and judging forms? Struggling with an Excel spreadsheet to manage your car show? 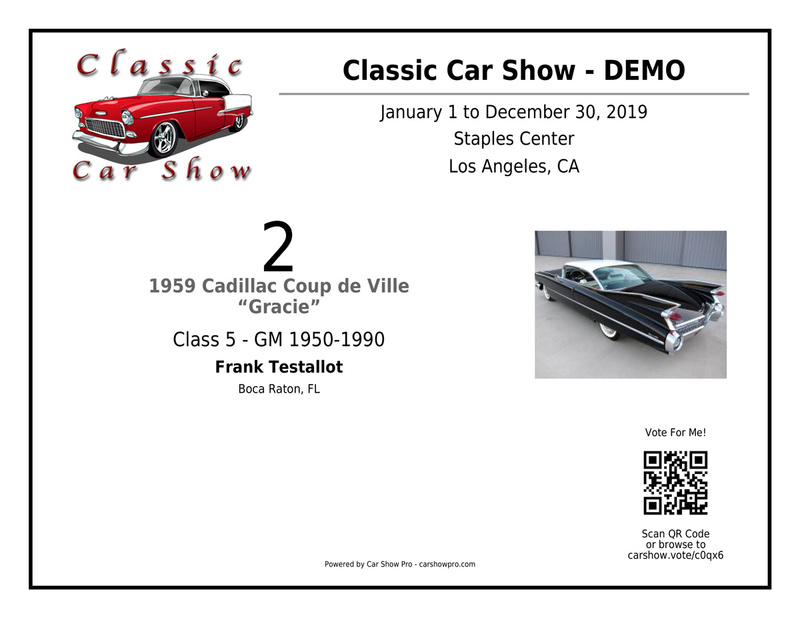 Car Show Pro (CSP) is a complete online solution to streamline and automate the car show experience for both car show participants as well as event producers. Watch our explainer video for an introduction to the features and benefits of using Car Show Pro to manage your car show. Car show participants can sign up for Car Show Pro quickly and easily (and FREE!). Build your Garage with all your classic cars, trucks and motorcycles, then register for events with just a few clicks. You'll even be able to view registration info for past events to track your participation. We've got the best Dashcards in the business. Your event information and logo are prominently displayed along with the auto ID and participant auto and owner information. Additionally, our Dashcards feature a smart QR Code, allowing both judges and spectators access to quick, easy and automated voting. Don't have a QR Code reader on your mobile? No problem! Spectators and Judges can also manually enter the voting URL below the QR Code or search for an Auto ID on the People's Choice page or Judging page respectively. Traditional Judging - Each show judge must provide a score for each judging criteria. Freestyle Judging - Judges can 'skip' judging criteria, a great solution for team judging. 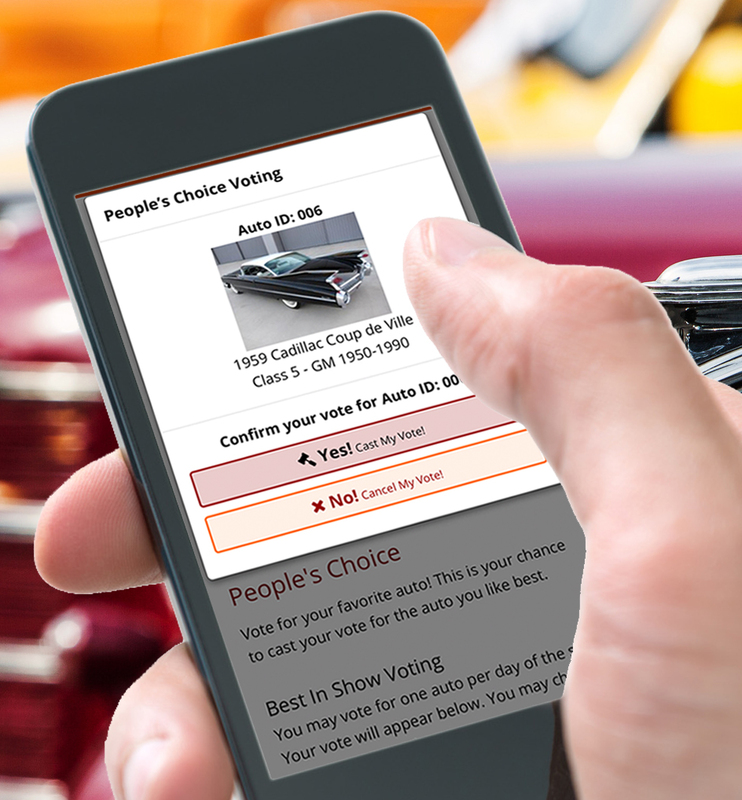 People's Choice allows spectators to vote for their favorite auto in the show using their smartphone. Best in Show - All autos compete regardless of auto classification. Best in Class - Each auto class competes individually. We even offer a paper ticket option as an alternative method for voting to accomodate those spectators without a smartphone! You can even create a new event using last year's event details, saving you time and effort setting up future events. Event producers can specify whether to accept registrations online, at the event or both! Reduce registration line-ups by allowing participants to 'pre-register' online weeks or even months in advance or choose to accept registrations solely at the event, or both. The choice is yours. We can even take care of credit card processing for online registrations. Event producers can assign multiple staff and judges for the show. This helps reduce registration line-ups on the day of the show and expediting the judging process, resulting in a more efficient and pleasurable experience. Our service is based on a 'per registration' basis. There are no monthly fees or 'package' pricing and all event producers have access to all our features, not just the big guys! For more information on our pricing, please view our Pricing FAQs or Contact Us. Registration and judging can be performed without the hassle of filling out, tracking, sorting and scoring paper forms. The system automatically updates winner's lists as cars are judged and event administrators can easily track the progress of auto judging and print reports (a printer is required). Our software runs entirely over the web using the most commonly available browsers. There is no requirement to download, install and update apps. It runs on virtually any laptop, tablet or smart phone using the latest standards of web development to ensure maximum compatibility across multiple platforms. All you need is a laptop, tablet or smartphone and an internet connection and you can host your event almost anywhere. NOTE: To print Dashcards and reports, a laptop and printer is required. For more information, or to schedule an online demo, call us toll-free at 1-844-855-4277 (4CSP).